Babies, I’m about to share with you an immeasurable treasure. After wallowing in the morass of the majority 2007’s TV season… (- Okay, big statement; there were a few exceptions, such as our adored Brotherhood and 24, amongst a few others, but I can’t think of the year without feeling the sadness of how bad Heroes was. *sigh*) Well, just not the best year ever, but I’m here to tell ya, kiddies, the last weeks of the year's end blessed me with the best thing to come my way since some brilliant person decided that you can actually roast peanuts in honey. This 21-minute slice of heaven is courtesy of a little Chinese noodle-delivery girl named Pucca. It would be totally understandable if that name or the fabulous show it graces is unfamiliar to you. 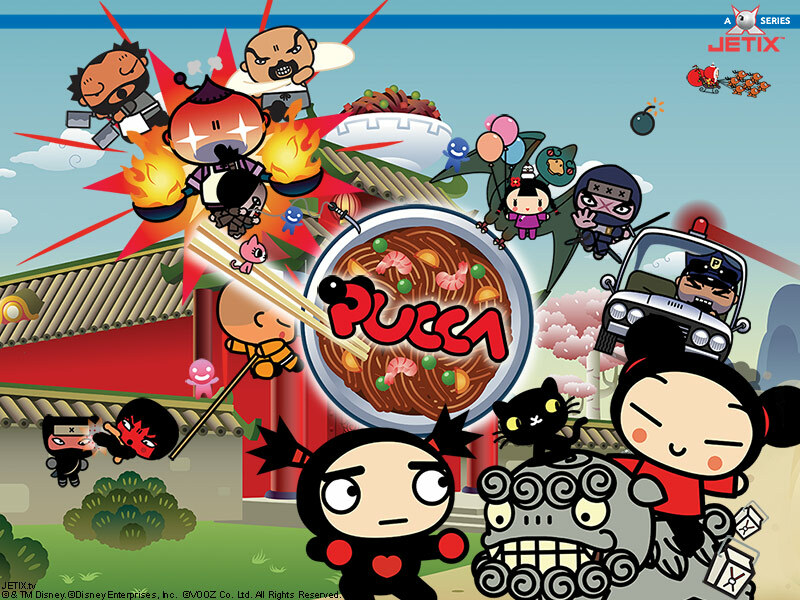 While a great success in Asia and Europe, Pucca has only been made available to North American audiences at the quirky behest of the ToonDisney channel’s Jetix programming. Quirky because the timeslot for the show has jumped around three times in the few months I’ve been watching, which ain’t exactly conducive to developing a fan following. No matter. 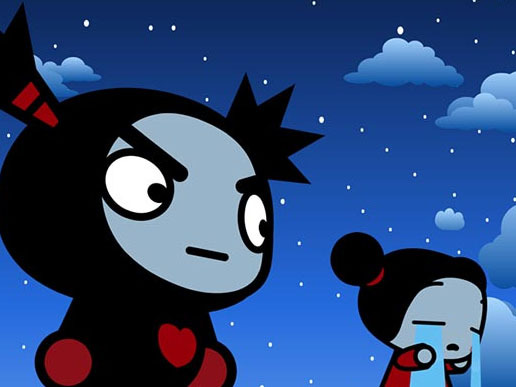 Pucca is so instantly addictive that if you watch it once, you will follow it wherever it goes. Here’s the skinny, Pucca is a little girl from idyllic Sooga Village who delivers noodles from her uncles’ restaurant via her trusty and freakishly speedy scooter. 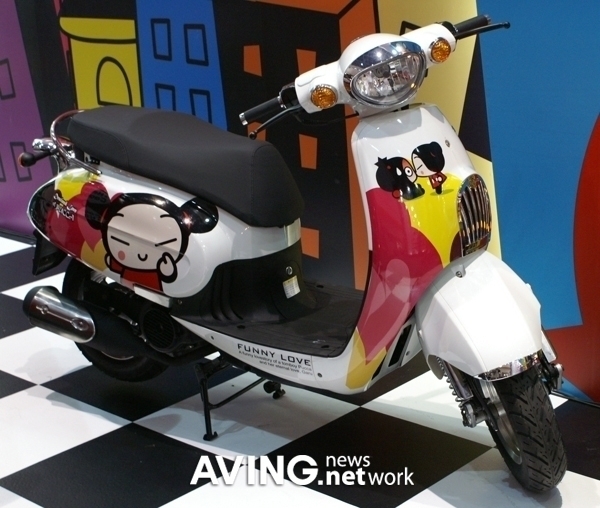 No surprise that her moped is super-powered; indeed everything about Pucca is mega-mega. This charming child with the odango-hairdo is blessed with super-speed, super-strength, and a super-jones for the local ninja, named Garu. 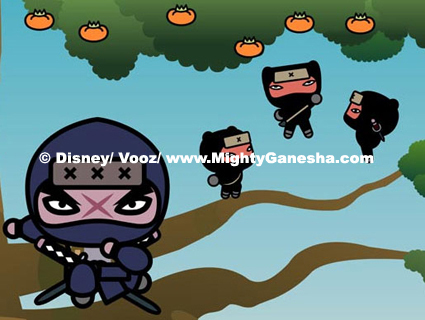 Unfortunately for lovestruck Pucca, Garu takes his bid to become a greatest ninja of all time extremely seriously and that means no distractions, especially from the amorous, smooch-seeking noodle girl. Pucca is nothing if not determined and will use her gifts and a heavy dose of kung-fu know-how to overcome any and all obstacles, including Garu’s enemies (- and sometimes his friends) and his own obstinance to get her man; kind of like how Pepe Le Pew would be if he were a little girl who knew karate. Neat thing about Pucca is as basic as a concept as that seems, it’s the magic of the show’s imaginative writers and producers that elevates that simple concept to something fun and entertaining on every level. 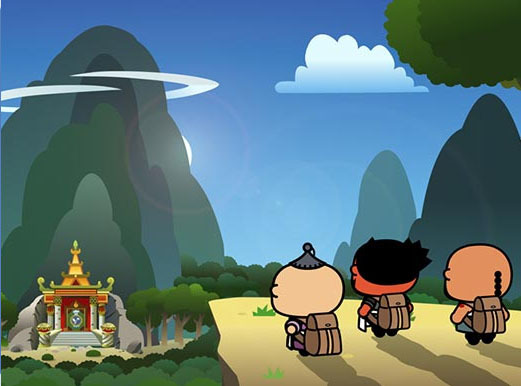 Each show features three different 7-minute stories that place Pucca, Garu, and their friends, the sword-wielding Ching, and Garu’s best pal, action hero in training, Abyo, in a variety of locations and historical periods. One episode will find them tooling around Sooga Village trying to save it from the threat of evil ninja, Tobe and Muji, a zombie master with a prehensile mustache. Another sequence will find them in Ancient Greece with Pucca as a goddess presiding over the first Olympics (- and giving a slight edge to her champion, Garu). Watch the Sooga Village versions of the characters visit their Old West doppelgangers. Abyo and Garu dance flamenco and prepare for the “r-r-r-r-running of the bulls” in Spain. Little Dutch girl Pucca delivers Pannekoeken in wooden clogs. Puccahontas helps Garunimo pass the test to become an Indian brave. Through the sharply clever scripts and wonderfully rendered characters, the show travels anywhere to any time and it’s all interesting and so much fun to watch. 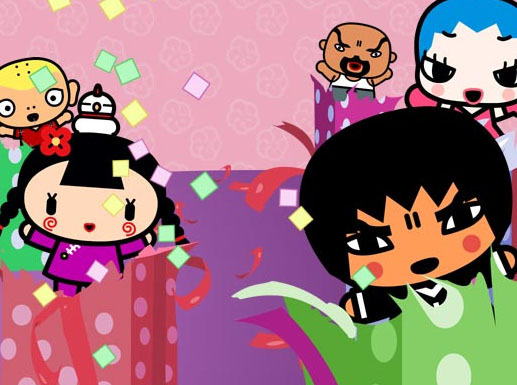 Pucca was created in 2000 by the Vooz Character Systems of Korea, and was originally meant to be a sort of Hello Kitty presence. 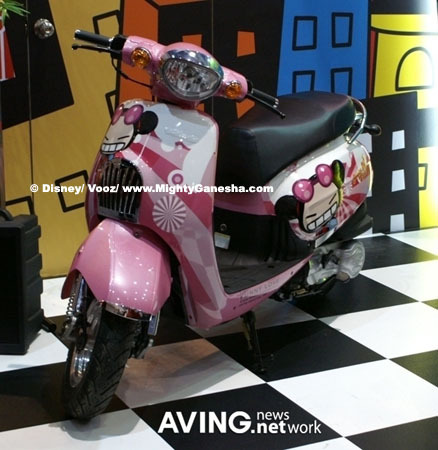 She’s on e-stationary and literally thousands of licensed products from cutlery to clothes to comic books to video games to adult-sized rideable scooters (- I know I should shun earthly desires, but Shiva, how I yearn to wrap my trunk around the pink Pucca-cycle! See the adorableness in the gallery and remember it's never too early to plan for Christmas!) . 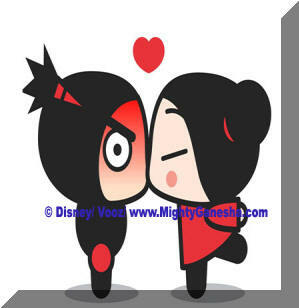 Pucca was first animated in a series of 2-minute Flash shorts called Funny Love, where the seeds of the character and her adoration of Garu were born. The Pucca television series takes the online shorts a lot further, fleshing everything out by adding characters, story arcs and dialog - that is, dialog for everybody other than Pucca and Garu: Garu has taken a vow of silence as he studies ninjitsu and Pucca is just so cute she doesn’t have to speak a word; all we hear from our heroine are occasional growls of frustration when someone messes with her man or adorable giggles and swak-ing noises when she traps her prey for some kissy-kissy. 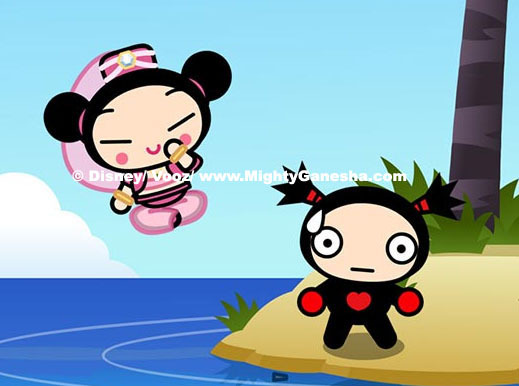 While the design of Pucca is deceptively uncomplicated, the characters all look like Sanrio-esque oblongs and squares. It’s what the animators do with their expressions and the amazing multi-layered 3D quality of the backgrounds that lifts Pucca from being a set of cut-outs on a flat surface. Garu’s hut is set in a jungle of bamboo, far away from the main village: The scenes of him training, leaping from tree to tree through early morning mists, each bamboo blade sharply drawn and exquisitely layered, giving the forest such depth that the scenes look nearly as convincing as those of Crouching Tiger, Hidden Dragon or House of Flying Daggers. Studio B, the animation production company in Vancouver that creates the TV series, spares neither expense nor frames on a cartoon design that one might initially dismiss as being “simple,” before taking a closer look. Pucca’s writing crew has mastered the elusive art of creating an animated show that truly pleases all age groups. 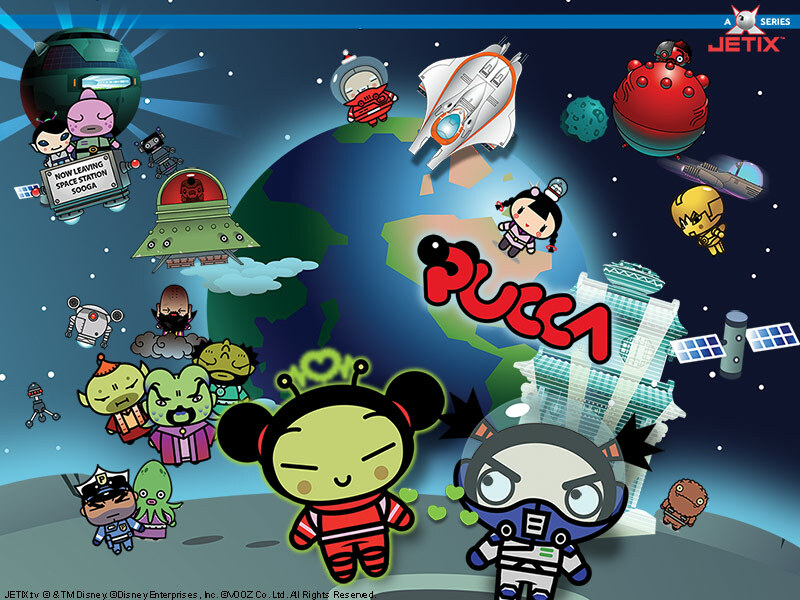 This is what’s remarkable about Pucca; there’s really something for everybody. 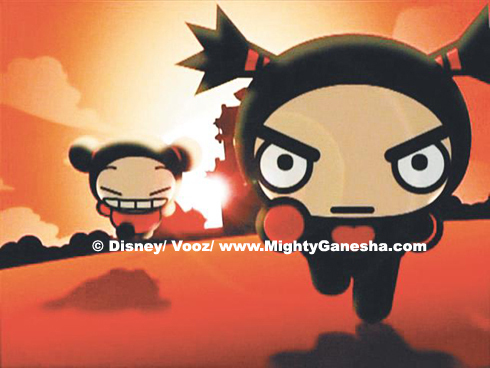 The obvious cuteness of the Pucca character and her sweet, winning personality are great for little girls, the martial arts fighting action will keep the boys’ attention, and the wit and intelligence of the scripts are broad enough for the youngest ones to enjoy, whilst being sharp enough for their parents or older siblings to keep watching even after the little ones are in bed. One of the fun aspects of Pucca that adds to its crossover appeal is the wide variety of pop culture references abundant in every episode. When one episode takes Sooga Village into outer space, Abyo is made up as C-3P0, Pucca’s uncles are a Vulcan, Ferengi, and a Klingon, villain Muji is cowled like Darth Vader and Pucca herself is a lovely shade of green with antennae like a Star Trek Andorian. Pucca’s trip to Japan is filled with tributes to not only Godzilla (- Who turns up unexpectedly through other episodes), but his underrated nemesis, Gigan. The group explores the neon and overwhelming traffic of Ginza. Pucca destroys a Dance Dance Revolution machine, moves on to some karaoke (- which we come in too late to hear) and battles sumo wrestlers who combine themselves into a giant mecha-sumo; luckily Pucca brought her magic wand and with a twirl becomes Super Sailor Pucca. In the aforementioned Pucca Goes Dutch episode, Pucca’s way with oil paint impresses the ear off of Vincent Van Gogh. A creepy Halloween segment is based on the Japanese horror film The Ring, with Pucca letting her hair down to scare everybody. Pucca faces danger in another episode at the hands of an amorous pop star clearly patterned after 90’s-prime George Michael. Even the characters are a designed as pop culture homage; Abyo not only looks like Bruce Lee - right down to the yellow Game of Death jumpsuit - but he makes his predecessor’s cat noises and has issues keeping his shirt on when faced with the happy prospect of a fight. Ching is sweetly drawn with Zhang Ziyi in mind. Pucca’s rival the spoiled, jealous Ring-Ring transforms into a costumed, painted-faced Beijing Opera singer and attacks with her hair and high notes. Garu’s main rival is the irrepressible Tobe, who’s like Wile E. Coyote to Garu’s Road Runner, and Tobe’s striking resemblance to Japanese film legend Toshiro Mifune is no coinkydink. If you get the references, great, but what makes Pucca exceptional is that the show works either way. I’ll tell you a thing about Pucca, no matter what kind of day you’re having, if your boss turned you down for that raise, if your teacher caught you with that crib note during the big test, if the shoe sale ended yesterday, if your macadamia coupon expired last week - whatever it is; watching five minutes of Pucca will put more right for you than a handful of happy pills. From the bouncy power J-Pop of the fabulous sing-a-long opening theme song, to the adorable giggle of our little super-powered heroine, you’ll be hooked instantly. Cute, clever, witty and fun, Pucca is the best thing there is on TV right now and deserves to be the biggest thing. Why aren’t more people watching?